Website design, re-branding, logo design, content strategy, and wordsmithing for a mindset coach and TV talk show host in Princeton, New Jersey. 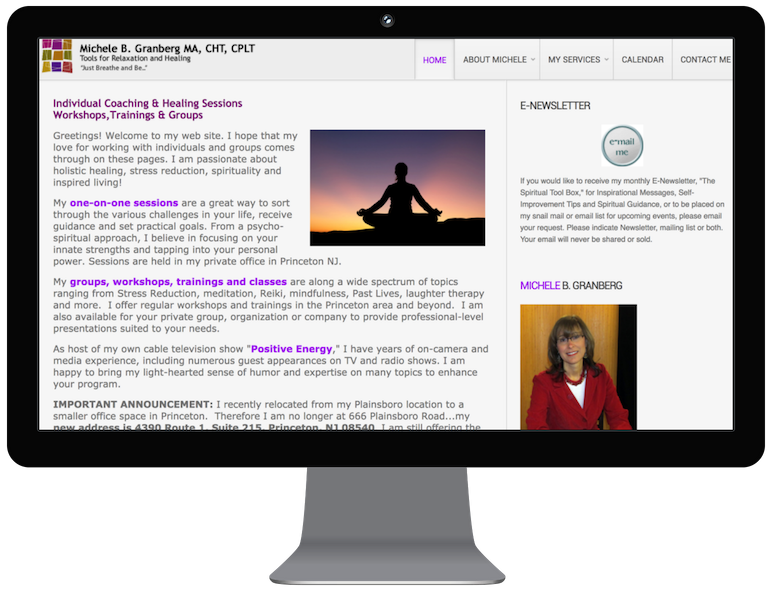 Michele had 3 separate sites that were more than 5 years old and not mobile-responsive: she’d had her private practice site; her TV show site; and a site for the brick-and-mortar healing arts educational center she had founded. She was looking to re-brand and consolidate as she refocused her energy and attention on her one-on-one client work and her TV show. Our goal was to give Michele a cohesive new online home with fresh, bright, modern branding. In looking to elegantly integrate the many services that Michele offers, it was especially important to define a coherent through-line that would tie all of her offerings together under one big umbrella. Claire is a creative web goddess genius. I highly recommend her—especially if you’re a wellness entrepreneur. I felt a lot of confidence in Claire bringing my vision and my brand to life. My new site is fresh, interesting and easy for visitors to navigate. I felt completely comfortable throughout the entire process, and I’m so pleased with the results.